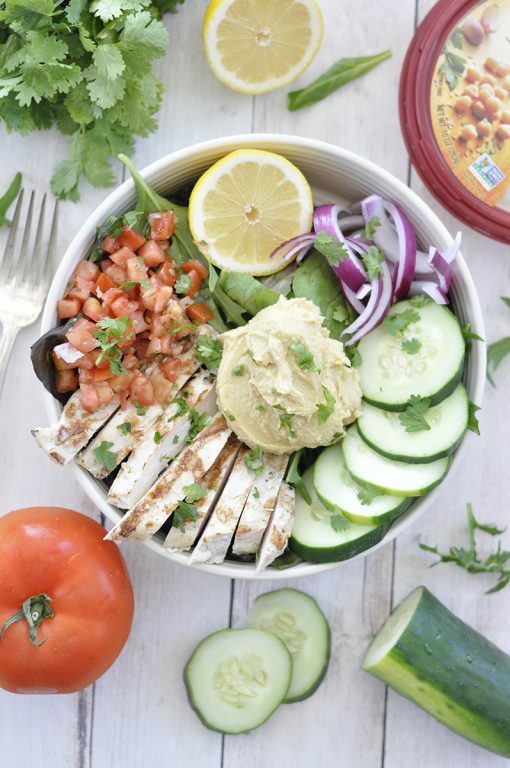 Power Chicken Hummus Bowl is a cross between a salad and a bowl and is a healthy Mediterranean-inspired recipe perfect for lunches or easy weeknight dinners! I am almost embarrassed to share this super easy thing with you. The weather is getting nicer and I’m craving lighter food. This power chicken hummus bowl is one of my favorite lunches when I’m working from home. 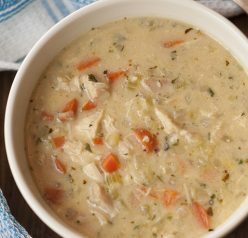 I can just throw a bunch of ingredients together in a bowl and have it taste amazing. I like salads, but there is nothing worse than a DRY salad. The hummus in this salad/bowl saves the day because I mix it in and it makes the entire salad nice and creamy. The flavor is also enhanced by the hummus which is a win/win in my book. I added a nice homemade apple cider vinaigrette, but feel free to use any dressing you prefer. 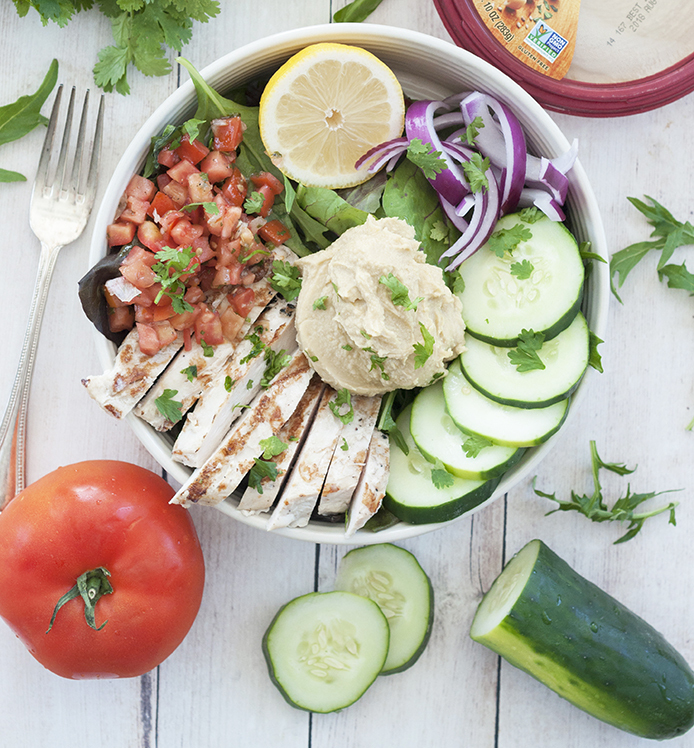 You have everything you can possibly need in this power chicken hummus bowl. 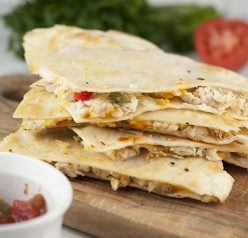 It is packed full of protein to keep you feeling full all day. It’s so easy to make, but major flavor with all these players. Yes, that’s ME talking…about vegetables. I live for simple salads like this. My collection of The Best Summer Salad Recipes is my food bible in the summer when I’m craving lighter food (and need to fit into a bathing suit at any given moment). They are just so simple to put together and they have so much character! I have always gone overboard with salads in the past and add too many ingredients, but the toppings and dressing for this power chicken hummus bowl are simple and the flavors are great together. The pretty colors don’t hurt, either! If you’re looking for another healthy recipe using hummus, try my Pine Nut Hummus Pico de Gallo Tostadas. I’m all about hummus lately! You will also love this Avocado Chicken Salad Pinwheels. Those pinwheels are great for lunch OR dinner. I also like to put them out as appetizers when I have a party. 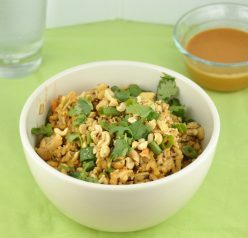 Toss all ingredients in a bowl or leave separated, sprinkle with fresh Cilantro. Top with a light vinaigrette and enjoy! Great dish! The weather is really warming up here, and we’re looking for nice, uncomplicated meals. This is perfect! Thanks. I’m so so glad you shared this bowl – with warmer weather here too I crave salads and bowls – today you have inspired me to use up the last of the hummus I have in a bowl like this! YUM! It looks amazing and so uncomplicated! Thank you for sharing!! My friend was cooked it on her party and I asked how to prepare it. She shared it to me and now it my turn to cook it. No hassle is preparing the ingredients. The recipe is easy to cook as well.